On Saturday morning May 12, 2007 I got up early and checked out the camera gear. I decided that today I would join the many birders expected at Evergreen Cemetery, known to be one of Portland’s finest spots to view warblers and a plethora of other birds. I’m pleased I did as it turned out to be another great morning. I was at the site before 0700 hours and warblers were all around the pond which was our starting point. I felt a bit guilty about taking the day before off (Friday) from seeking birds, but it was raining and I was tired after four days of rising early to image. I needed many hours on the computer to review image files and enhance the 'keepers'; this is literally how I spent the day well into the evening. But on this Saturday I was prepared and ready to start anew… As we milled around where people parked by the pond a semblance of several groups formed and various tours commenced. As stated, it didn’t take long to start viewing some really wonderful birds. As I was looking around, my friend Bob, visiting from Colorado, arrived to join the group as well. He’s been a terrific spotter and a great help to my efforts; I was pleased to see him again. 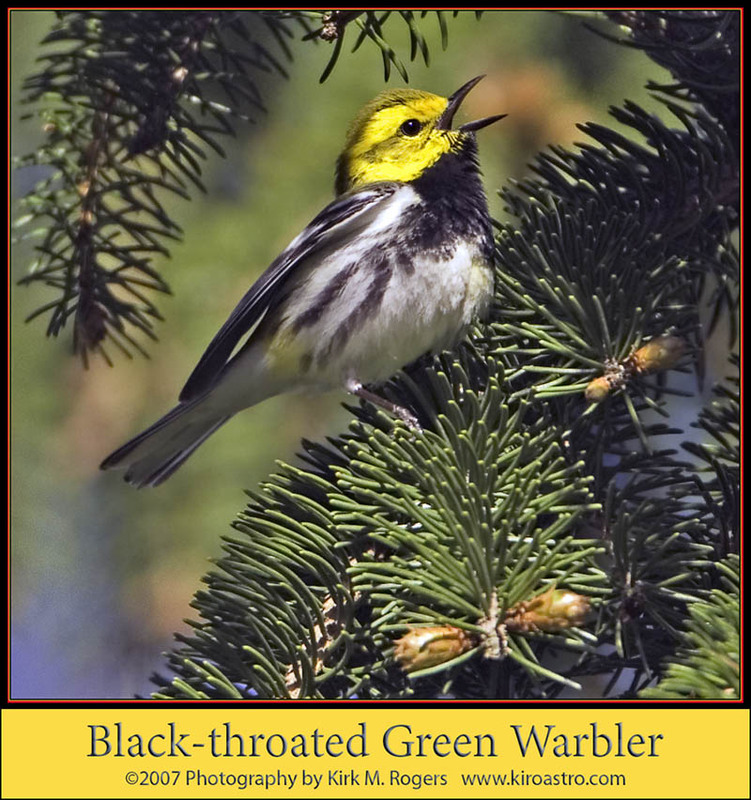 We started out with several birds directly in our vicinity and I was able to capture a few exposures of this beautiful Black-throated Green Warbler. After a time we started down the path that follows around the pond. There were many people in the area by this time. This activity just brings out the enthusiasm and better nature of most folks and it was fun. I’m generally alone when trying to photograph birds but I didn’t mind this at all. In the image at right, a group of turtles was taking advantage of the morning sun and were lined up on a log. The Black-and-white Warblers were present as they have been all week. I’ve imaged plenty of these of late but never tired of their antics as they search out the trees for forage. Below is another group of images taken during the walk. All things considered, I don’t believe the lighting was as helpful as it had been on other days during the week. It went from shadow to bright harshness quickly as the sun continued to climb, which made some of the images difficult. Plus the most activity appeared to be on the wrong side of the pond to keep the sun at our backs. We went for a spell where we didn’t see much of anything as we walked the path. 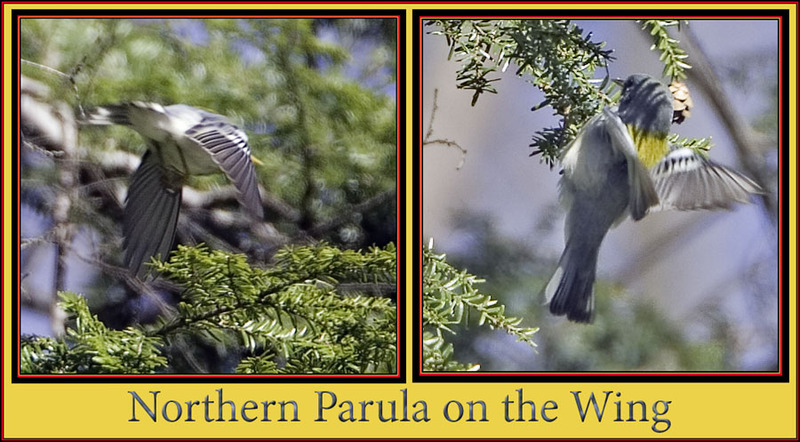 We had multiple sightings of the Northern Parula, which I was pleased about. I was hoping to obtain some new images as those I had posted were taken a great distance. The two composites below were taken during the course of the several hours I was at Evergreen. This is one of several fiddleheads exposures I took. It was at 1/320 second at f5.6; I was still in ISO 400, the setting I was using for bird imaging at 700mm focal length. In my view ISO 400 appears to be the best setting to bridge the compromise of shutter speed versus noise when using digital capture. I’ve been asked multiple times about the magnification of my lens extended to 700mm. It works okay for imaging warblers but I’m never pleased when the image base isn't large, which is often the case with these smaller birds. I’d much prefer to have the subject fill the frame which I’ve done so many times before. I hope some of you folks that were walking with us view these photographs because the next image is the full file size using one of the fiddleheads as a reference. Another bird that was spotted on several occasions on the walk was the Pine Warbler. The composite below is from the various sightings. It had been an active morning at Evergreen Cemetery with many people coming around at all levels of interest. I really didn’t know anybody in particular, but this isn’t an issue on these forays and I was beginning to see familiar faces from earlier in the week at Hinckley. I asked Bob, an Audubon staff member, if he or someone kept a sightings list and would post it. He indicated this would be done; as I didn’t take any notes, this list will be referenced here once the information becomes available to me. As always, thanks are due Bob and the other Audubon staff and members for their generosity in time and sharing of knowledge on these outings. A note about the photography...Unless specifically credited otherwise, all images in this account are by the author. Any images viewed that are digitally framed and labeled have been printed and added to my collection of works for sale. The web versions are nice, but a full resolution print significantly enhances the beauty of these images; all are ©2007 Photography by Kirk M. Rogers - any reproduction, publication or transmission of this content without the consent of the author is prohibited. Please contact me should you have an interest in obtaining any of the images.